In 1969 Elisabeth Kubler-Ross published On Death and Dying where she introduced The Five Stages of Grief model explaining the five different stages that one goes through on their journey toward acceptance of a loss or change. These stages are not chronological nor are they a one way progression as one can vacillate from one stage to another, skipping some altogether. As this is a history blog I felt like sharing with you where I am right now in my progression - see that graph above? I'm definitely on the upward turn of that line which to me sounds so positive and hopeful - something that helps me in my transition to my new life without my father. I've skipped a few of those emotions on that downward slide - maybe I'll slide back, maybe I won't but for now I am looking up. 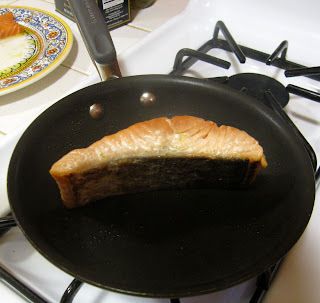 Yesterday afternoon I was inspired to try a new method of cooking salmon to help out a friend who was looking for a health way to cook fish on the stove top. 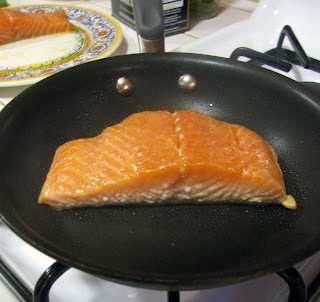 I love salmon and prefer it cooked on the BBQ with just a light covering of olive oil and kosher salt which leads to a crispy exterior and a creamy/buttery interior. As I began thinking about my meal, I thought how could I replicate the BBQ effect on the stove top? 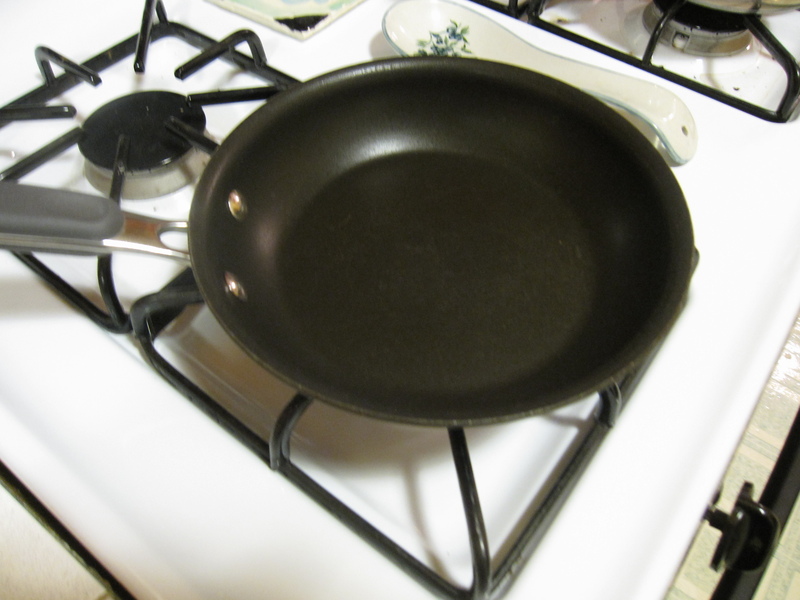 I started with the pan - no cast iron or Calphalon for this project. I went for my small nonstick pan as I wanted to eliminate all possibility of the fish sticking to the pan. 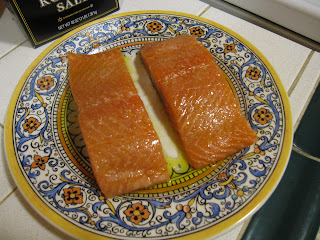 Then I prepped by salmon just as I would for the BBQ - a light covering of olive oil with a sprinkle of kosher salt on the top. With the pan heated up to a level four (out of ten), I laid in one of the salmon steaks, skin side down. The majority of the cooking is done with the skin side touching the heating element (pan, BBQ, etc.) as it is a natural protector to keep the fish from burning. Now it's time to wait patiently for the salmon to cook. No turning, no fiddling, just waiting. 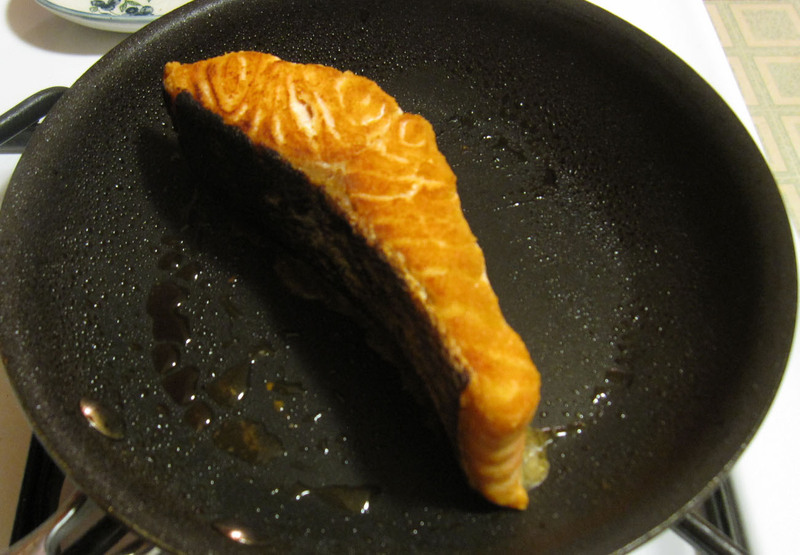 With the photo above you can see that I've just added the salmon to the pan. About five minutes later it looks like this. See how the bottom layers of the salmon are turning a pale peach color and losing the translucent salmon color? When it looks like the cooking is halfway up the steak, the steak is very close to being done. Now it's time to turn the steak in order to finish cooking the sides and top and to give it a little color/crunch. Pick a side and turn it. It should sit right up without falling over as mine did. Let it stay here for about a minute. The sizzling you will hear will result in the exterior crunch. Then turn it over. Wait another minute on the other side and then place it face down on the pan. At this point the salmon is done and only needs a few seconds face down to give it some color per your preference. 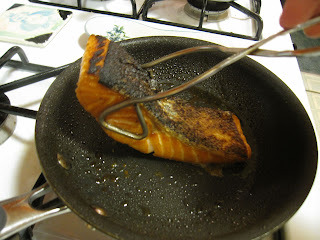 I was very happy with the result as the salmon had that exterior crunch that I adore along with the creamy/buttery interior. 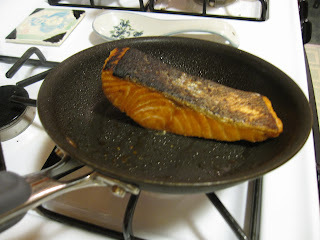 The salmon cooked for maybe eight minutes max- talk about a fast and healthy main part of a meal. 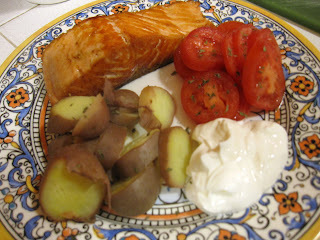 With some fresh sliced tomatoes, gently boiled potatoes and greek yogurt my meal was complete. 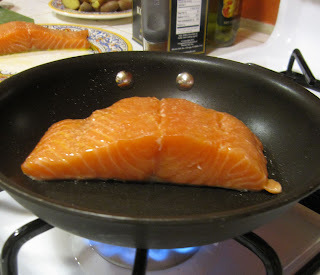 Love your detailed technique for the salmon - sounds and looks so tasty! And as for Kubler-Ross - that little chart & the truths you speak have been so helpful to many since her book came out. It's not a straight, even path, but glad you are feeling good and moving forward. I read her book when it first came out. Works for most things. I will say, when my husband died, I was at my lowest at the 3 year mark. I love salmon cooked anyway there is. Yum! 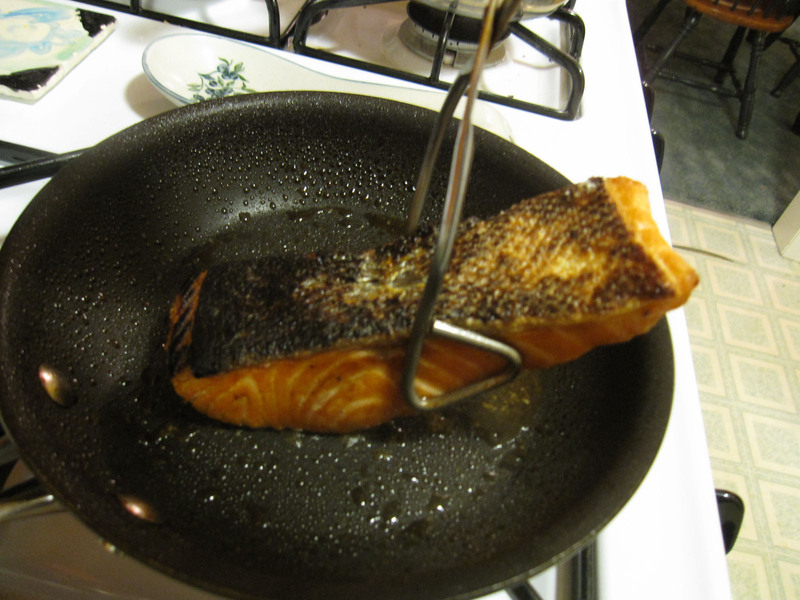 I love that you made your salmon do yoga. It looks delicious and I really wish salmon didn't make my husband gag. I love it and only get it when we go out now. Glad to hear you are on the upward swing and hope it stays that way for you! Hahahahaha! Salmon Yoga!! I'm glad you're beginning to feel better. Laughter is one of the first steps towards healing. Looks delish! Glad you're feeling better. For me, I think I went through all of those "steps" in 2 timelines, if that makes sense. There's the brain, which went through them quickly, but it took my heart a much longer time to travel through the steps, and I'm not sure my heart agrees with the graph. It plummeted off a cliff, then took a long time to climb back up, and I'm not sure it ever really got back to where it was to begin with. I'm not sure I really "moved on" as much as learned to start all over with a new reality. This post has food, and food for thought. Glad to see you're eating so healthy, as that certainly helps a great deal. Loved the yoga reference too (also very healthy for body and soul)! Thanks for sharing!